I can never have enough quality adventures for the campaigns I run as I simply lack the time (or is it focus) to write them from scratch on demand. 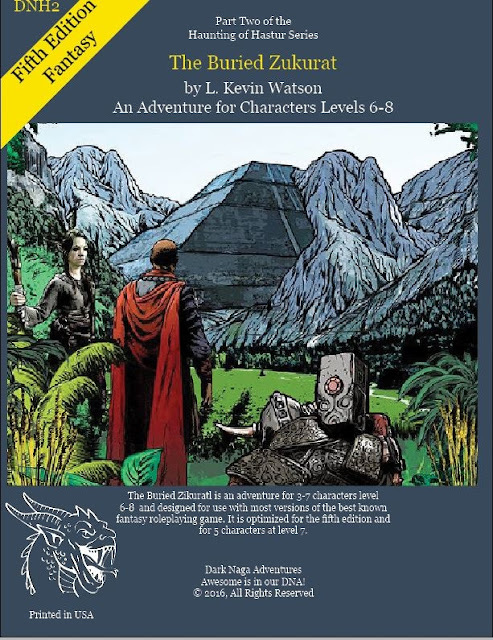 That being said, the rules set the adventure is written in is secondary to me, as I tend to mix and match elements from different adventures and sources (and rule systems) Some of the best sessions I ran were for Swords & Wizardry, using DCC adventures written for 3x, 4e and the DCC RPG. Story over crunch in any adventure for me. The clay mining operation at Caford has discovered a large step pyramid, or zikurat. This imposing structure was buried completely in the clay sheet they have been mining for decades to make brick and other ceramic products. The local miners see what they think is an obvious entrance, but cannot get past the slab of stone. A call for aid is sent to the capital city of Meawold, and the party is sent to investigate. Could this be one of the Nexuses that traded goods from the subterranean Land of Night to the surface world? Places where treasures of the subterranean kingdoms, like mithril weapons, were traded for surface goods. Bastions of trade that were lost during the fall of the First Age of Man. Why has it been dormant for almost two millennia? What lies within? Is it a threat to Caford, or the Kingdom of Meawold as a whole? The Buried Zikurat is written for 5e, but it will probably be run for Swords & Wizardry: Light (I'm working on that this summer) when I get it. And it probably won't survive the transition whole cloth, but that's okay. I'll certainly get my money's worth. Did I mention I'm a sucker for maps and detachable covers for adventures? Is that like a zigurrat? Yup. Just an alternate spelling in English since it's either an Assyrian or Babylonian word for Temple. Hmm, the comments mention an OSR printrun as a stretchgoal, but no mention of the dollar amount needed. If I read comments correctly, this adventure will have rules specific editions while the previous one was dual-statted.